The ever emerging talent of Maggie Rogers has continued to grow from her viral introduction to the world less than a year ago. A five track EP has been produced in a relatively short space of time since then with the famous ‘Alaska’ single taking centre stage. The single has delicate beats and clicks with gently warping electronica which go on to merge into one as the verse bridges to the chorus. Once there, a muffled, but heavier beat gives the song a catchy quality without sacrificing the delicate and natural sounds that are reinforced through her wispy melodies. With ‘On + Off’ we hear her develop her sound even more with a song that features bolder samples and piano loops which are woven together into a melodic fabric with a subtle, but charged rhythm driving it. Maggie sings with a almost a folk swoon that exudes calm and control to balance against a busy instrumentation. The lightly whirring electronica of ‘Dog Years’ bounces off her vocals generating a symmetrical sound and this is the basis for the gradual flourishing of the song in the choruses. Though it’s more typical of a sophisticated contemporary Pop song, it still demonstrates her knack for production and her graceful delivery. ‘Better’ is a refrained track featuring multiple layers of wiry and whirring electronica arranged in an airy, chilled fashion which serves as the perfect environment for Maggies relaxed vocals. ‘Color Song’ is mostly an a capella song with an earthy and calming feel as Maggies multiple tracks vocals gently sweep across each other. She’s certainly proved herself to be an accomplished producer with an ability to fuse opposing sounds together in a seemingly effortless way. Introverted songwriting mirrors the imagery she uses to channel her lyrics and with these aspects she moulds songs that are multi-dimensional and functional. No long a viral sensation, but a proven talent. Maryland’s Maggie Rogers was unwittingly thrust into the viral spotlight last year via Pharrell Williams stunned faced and almost by accident, her career has took off. She certainly has the talent to justify what for her is totally unexpected praise and attention and with her initial singles she’s demonstrated a keen ear for simple melodies and musical fusions and a versatility to make it work. With ‘On + Off’ we hear her develop her sound even more with a song that features bolder samples and piano loops which are woven together into a melodic fabric with a subtle, but charged rhythm driving it. Maggie sings with a almost a folk swoon that exudes calm and control to balance against a busy instrumentation. Her talent is growing with each new track and this is just another landmark of it. Many people have already seen the viral video of Pharrell Williams listening to ‘Alaska’ by Maryland NYU student Maggie Rogers earlier this year. In amazement he declares her sound unique. That may be a slight overstatement with clear similarities to Christine and the Queens, Anna of the North and certain tracks from Grimes. Despite this, to be comparable with them so soon, shows that’s there’s real talent there. Her new single ‘Dog Years’ is another chance to demonstrate this and though not as seamless as her first track (being broken up by more prominent beats), it still chimes and sweeps effortlessly. The lightly whirring electronica bounces off her vocals generating a symmetrical sound and this is the basis for the gradual flourishing of the song in the choruses. Though it’s more typical of a sophisticated contemporary Pop song, it still demonstrates her knack for production and her graceful delivery. If the only way is up, then she can really be as unique as Pharrell suggests. The Soul and Pop legend that is Lionel Richie attracted the biggest crowd of the festival with over 100,000 moving to tracks like ‘dancing on the ceiling’ with thousands all decked out in what was the most popular merchandise of the festival. It’s almost like they missed a trick not making him a headline act given his reception. Similarly Pharrell got the crowd going in an enthusiastic fashion and both provided the simple feel-good factor. Mark Ronson went all out in his efforts to wow the audience with his set. He did just about played and tampered with everything available and rolled out a varied list of artists to give him a hand from Kevin Parker, Kyle Falconer, Boy George, Grandmaster Flash, George Clinton and Mary J. Blige to name a few! Outstanding effort from Ronson to give the audience more than their money’s worth. Florence + The Machine delivered a high energy performance verging on the insane as she belted out her simple yet sophisticated catalogue of music and paid tribute to the missing Foo Fighters with her own rendition of ‘Times Like These’. The fact she’s back to number one in the album charts should tell you all you need to know about the impact of her performance. Future Islands rocked out another fine performance, despite feeling the fatigue slightly in what has been a non-stop year and a half for the band. Samuel Herring still amazed and frightened the life out of people with his now trademark stylish aggression, passion and ridiculous dance moves. In a similar but wonderfully sleazy way, Father John Misty thrust and launched himself just about everywhere, but delivered every track at album level quality. ‘Bored in the USA’ was just as theatrically trashy and even unnerving as you’d expect and was a sight to behold. Meanwhile, Courtney Barnett made herself feel at home at the Pyramid Stage of all places whilst effortlessly and breezily rolling through set in her typical laid back style. Glastonbury veterans delivered their set as if it was 1993 again and even stole a lot of the crowd away from Kanye’s headline act. The Who rolled out a hit feast for the fans and delivered also delivered a performance like their famous seventies gigs, but at a slower pace, still worth seeing despite their advancing years. He was causing controversy before and after the his headline slot with many signing petitions to get him removed, but he was there in defiance and the opening stages of his set delivered some of his biggest tracks and was almost space age in it’s opening and set up for his ego with him and the lights on him. As simple as that. It worked wonderfully as a statement, but for the whole show it’s novelty wore away and he really should have took a leaf out of Ronson’s book for the middle and latter stages of his set. Not even Kanye can do everything on his own. The fact he claimed he was the biggest rockstar in the world is of no concern to me… it’s that sort of musical conservatism that stifles music and similarly threatened to stifle the festival, but Kanye was always going to be there and divided the majority of the audience straight down the middle. 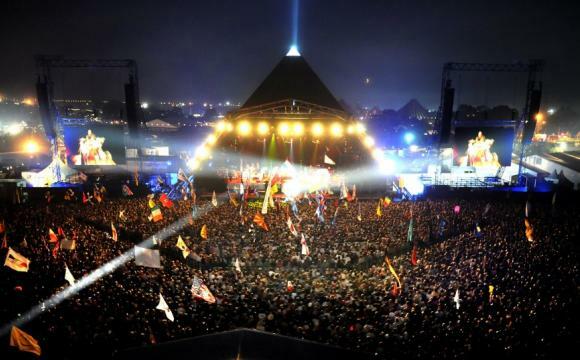 The Libertines were also left high and dry by being moved up the billing thanks to the Foo Fighters absence and their disjointed and worn set did nothing to get anyone shouting. 2013 has been one of the peaks of Daft Punks career. A reinvention on their part that really worked wonders and their appearance not being an issue. It was primarily a commercial success based on the music. That is surely only a positive thing. Random Access Memories is a great album on the whole. They wished to produce an album of the like of Sgt Pepper or Dark Side of The Moon and I think they’ve certainly replicated the flow and natural feel from track to track; if not the innovation to the extent of those examples. Though Get Lucky has been massively overplayed; there are other tracks that more intricate and refined and one of those is Instant Crush. It features another big collaboration with the Strokes frontman Julian Casablancas who I can imagine loving working with Daft Punk as his 2009 solo album Phazes For The Young might indicate. This song features a simple yet effective plucked guitar riff with some basic synth chords but these step up during the chrous and largely takes over from the guitar. The guitar riff is similar to that of Andy Summers on the famous ‘Every Breath You Take’ single by The Police in 1983 and has the same hook providing effect. Julians vocals are also put through the vocoder or whatever vocal manipulating equipment they have at their disposal. The vocal approach of Casablancas is more of a subtle ‘One Way Trigger’ sort of vocal and despite the manipulation of his vocal, you can still detect the character of Julian’s voice too which gives it a dual quality and compliments the music well but not smothering it either. One of the albums highlights. One word with this album. COLLABORATIONS! Lots of em! Two of them of which are the most prominent appear in their single ‘Get Lucky’. This song is a symbol of them largely ditching their samples and getting in live musicians to replace them to replicate the musical era that appeals most to them: the late 70’s and the 1980’s. To do this they enlisted the help of Nile Rodgers, and his simple yet rythmic 70’s dicso guitar riff drives the song in a subtle way which at the same time speaks volumes on a Daft Punk track. The bass mirrors this to really get a beat and continuous ‘groove’ going throughout the song. Pharrell Williams’ higher pitched vocals on the chrous and his lower pitched, drawn out vocal on the verses are both reflective of a 70’s disco tune and compliment the range of sounds from the low bass line, Rodger’s guitar riff inbetween and Pharrell’s vocals at the top of the range when joined by the vocoder manipulated vocals; just comes together in effortless fashion. This is in part due to the slick work from Thomas and Guy in the way of production. It is perhaps even more heavily produced than any of their previous albums due to the scrutiny and re-working that will have been done on the live instruments and vocals to make them sound as clean and as crisp as possible. If it’s done right then a heavily produced album works and it’s the case here too. ‘Instant Crush’ features another big collaboration with the Strokes frontman Julian Casablancas who I can imagine loving working with Daft Punk as his 2009 solo album Phazes For The Young might indicate. This song features a simple yet effective plucked guitar riff with some basic synth chords but these step up during the chrous and largely takes over from the guitar. The guitar riff is similar to that of Andy Summers on the famous ‘Every Breath You Take’ single of 1983 and has the same hook providing effect. Julians vocals are also put through the vocoder or whatever vocal manipulating equipment they have at their disposal. The vocal approach of Casablancas is more of a subtle ‘One Way Trigger’ sort of vocal and despite the manipualtion of his vocal, you can still detect the character of Julians voice too which gives it a dual quality and compliments the music well but not smothering it either. 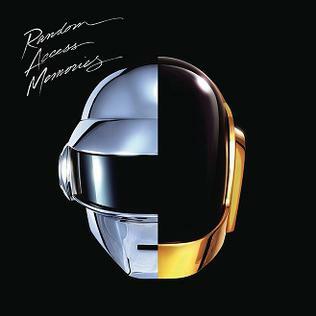 Panda Bear joins Daft Punk with the song ‘Doin It Right’ which starts off with a heavily vocoded vocal with the repetitive “Everybody will be dancing…” which becomes the rythm section as Panda Bear’s vocals interlock with the manipulated, rythmic vocal brilliantly. ‘Fragments Of Time’ featuring Todd Edwards barely sounds like a Daft Punk tune which is pretty much a direct reflection of the 70’s and 80’s disco and R&B references with their subtle, broken organ and synth sounds joining in on the chorus. The vocals go well with the sort of music being represented but are pretty standard. Perhaps this song will be a little hard to understand for die hard Daft Punk fans but musically it’s pretty sound if vocally a little off. Songs such as ‘Game Of Love’ can at times sound like vocoder overload, but after a few listens it does grow on you slightly and the funk style instumentals sort of match up with that and the synths in a type of unconventional union of old and retro with new and futuristic. But this union is conducted much better on other tracks such as ‘Give Life Back To Music’ which again has another notable contribution for Nile Rodgers. The song itself builds up well on the bridge between verses with effective results. Beyond even starts off with a string orchestra before going into the electro – retro fusion and this is something that has been achieved to great success with this album. The fact that ‘Get Lucky’ should be a good event for people. Eventhough it’s being played to death at the moment, it’s a proper song in how it’s been crafted by musicians, written by musicians, produced by musicans and played by musicians and talented ones at that with bags of experience. The fact this sort of music is topping the charts whether it’s your thing or not should be celebrated. Thomas Bangalter pointed towards the likes of Rumours by Fleetwood Mac, Dark Side Of The Moon by Pink Floyd and Sgt Pepper from The Beatles as “the ones that take you on a journey for miles and miles.” They all served as some of the several models for creating an album that provides that journey which they have managed to achieve in a sense you can become engrossed and lost within it. Many say it’s their best album and im not sure. Perhaps it is in how they are more skilled now and have proved successful with this different approach. But it’s not so important right now. People should just enjoy what is more than just a solid album from the French duo.